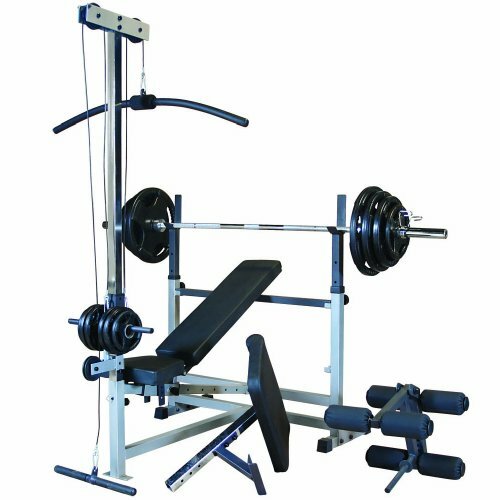 Body-Solid PowerCenter Combo Bench Package. Get a total-body workout on the most versatile and complete combo bench available. The PowerCenter Combo Bench (#GDIB46L) is a Flat Bench, Incline Bench, Decline Bench, 90° Shoulder Press Bench, and Seated Leg Developer all in one. You can see the dynamics of this bench as soon as you glance at the multi-position, telescoping uprights that safely hold the bar for bench exercises. The 6-position Flat / Incline / Decline / Bench features pop-pin adjustable DuraFirm"! seat and back pads that are extra-thick, ultra-comfortable, and will never bottom out. The rock-solid strength and stability of the PowerCenter Combo Bench comes from the extra-heavy 12-gauge all-4-side welded high tensile strength steel mainframe. Strengthen, tone, and develop your knee, thigh, hamstring, and glute muscles with the six-roller Leg Extension / Leg Curl Station included with the PowerCenter Combo Bench. Thick, oversized foam rollers provide complete comfort through heavy lower body routines. Package includes GDIB46L PowerCenter Combo Bench, a Preacher Curl Station (#GPCA1) for optimum Biceps development, Lat Pulldown / Low Pulley Station (#GLRA81) for accelerated back and deltoid development, and 300 lbs Rubber Grip Olympic Weight Set.